Sangria is the perfect party punch and, when it comes to Halloween, a "bloody" sangria is a spooktacular addition to the celebration. This deep-red recipe is easy and can be customized in many different ways. The sangria uses a "blood" red wine base and the color can be enhanced with a little grenadine if you like. It mixes up quickly the night before the party and preparing it for service should take just a few minutes as well. Decorating the sangria is the really fun part. Hang a few gummy worms on the side of the punch bowl, float edible eyeballs inside, and feel free to freeze all kinds of creepy crawlies in ice. It's Halloween and your imagination is the only limit. Pour the wine into a pitcher. Squeeze the juices from the lemon and orange wedges into the wine. If possible, remove the seeds, then toss the wedges into the punch. Add the sugar and stir thoroughly until it dissolves. Chill overnight to marry the flavors. Add the ginger ale or club soda, grenadine, and creepy candy just before the party starts. For the deepest red wine color, choose a Cabernet Sauvignon, Merlot, Rioja red, Zinfandel, or Shiraz. If you'd like to serve the sangria right away, use chilled red wine and serve it over lots of ice. Do you want your sangria to be just a little stronger? Add a shot or two of gin, brandy, or rum. Halloween is the one holiday of the year where anything goes. Sangria fits perfectly because there are no rules to sangria either. 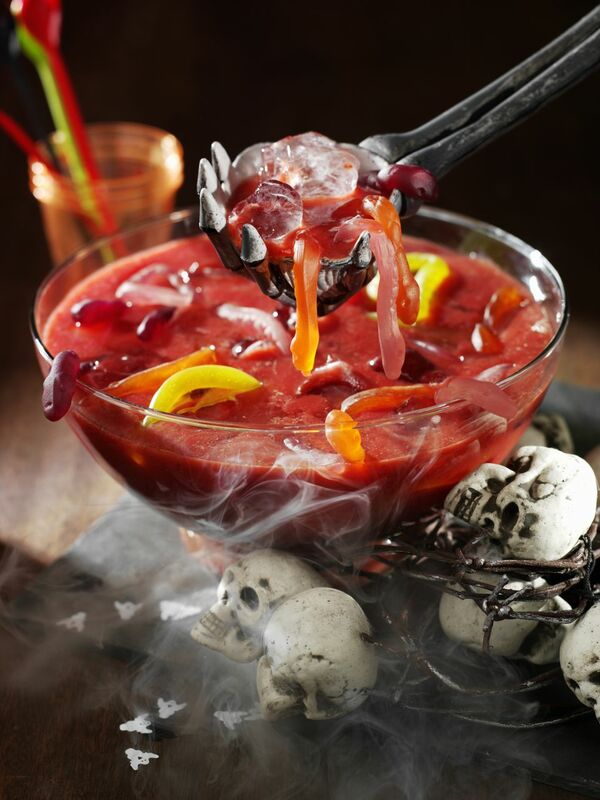 Have fun and use your imagination to add creepy elements to your punch bowl. Freeze plastic spiders and other cheap, spooky toys in ice cube trays. Halfway through the freeze, add a drop or two of red food coloring or grenadine to each cube. Edible eyeballs are always a fun addition to a Halloween drink. Olives are the easiest "eyeballs" though you can build your own with fruits like lychees and blueberries. Float them on top or freeze them in ice. Add fresh fruit to the punch. Sliced strawberries, peaches, kiwi, or a handful of fresh blueberries and raspberries are all fun options. The bigger variety of fruit, the better because it looks like a witch's brew. The fruits can also be frozen into ice cubes. Add black plastic spider rings to the stem of your wine glasses to complete the Halloween effect.